One of the announcements in the watchOS 5 section of WWDC 2018 was the fact that a new Watch face was being added to the mix: a rainbow-striped Pride face now available for free to any Watch user. Announced alongside was a matching Nylon Pride strap, being sold for $49 / £49 / AU$79, a white-and-rainbow number with donations being made to LGBTQ advocacy organizations Gender Spectrum, GLSEN, ILGA, PFLAG, The National Center for Transgender Equality and The Trevor Project. What wasn’t clear on stage is that the Watch face and strap combination fit together nicely, with the colored stripes of the band matching those on the Watch face exactly. Well, for the more OCD-suffering of us, the fact that the strap is white and most Watches aren’t is annoying - unless you’ve got the ceramic (and very expensive version, that is). The Nylon strap has a Pride 2018 label on the inside too, just in case someone finds your Watch without you wearing it and wonders what cause it’s supporting - a common question for a thief. The Watch face itself is pretty sparse, with only one complication you can change around - it’s basically just the time and six colored stripes that wiggle a litlte when raising the wrist. You might not see the face as an option straight away, despite it being launched at noon on June 4, but update your Watch to the latest software or check for it in the Watch app on your phone and you’ll be able to select it. 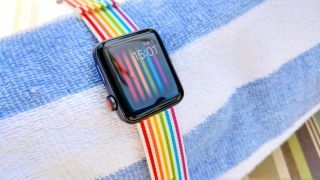 It’s unclear how much of the profits from the band Apple gives to the organisations it’s supporting, but at the very least it’s raising awareness of the Pride movement and giving any Watch owner a chance to show their support.